“We often talk about Chad Billingsley, saying that he pitches ‘with the Sword of Damocles over his head.’ That’s an old Greek legend. The ruler was Dionysus, and he had a guy in the courtier – in the court – who would always talk about how great the ruler had it. So finally, the ruler said, ‘Ok. I’ll tell you how great it is.’ – the pitch is high, ball two – and he had a big dinner for Damocles and there at the head of the table was the chair and the beautiful table set up. Damocles sat down and directly above his head was a huge sword and it was tied by one horse hair. Damocles got the idea. 2-2 pitch on the way is fouled back. So, of course, any time anybody’s pitching in a somewhat precarious position, I guess it applies: The Sword of Damocles. And, with Chad Billingsley, with that touchy arm, any time he goes to the mound that’s exactly who he is: Damocles of the Dodgers. Amarista at second, Maybin at first. This’ll be the seventh pitch to Eric Stults. Chad ready, checks, right-hander deals. High fly ball to deep center…Kemp going back…a-way back…this one is over the wall! There’s a lot of broadcasts out there that sound exactly the same. Broadcasters and color commentators are constantly talking about how a specific player is a “competitor” or [insert generic baseball cliche here]. 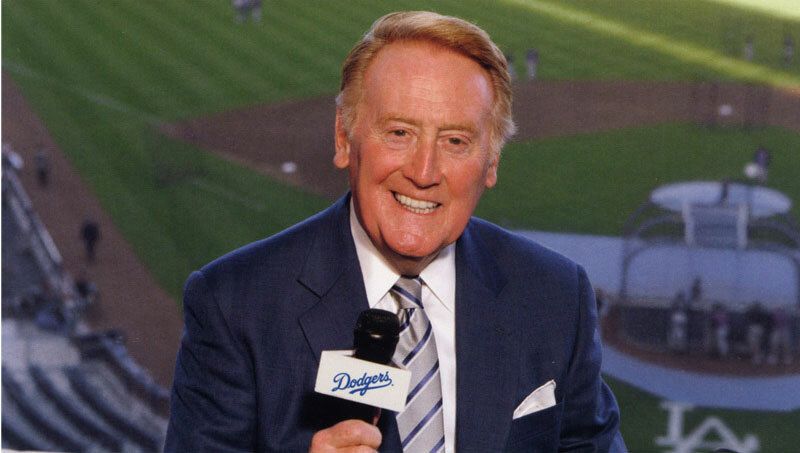 Nothing sounds like a Dodgers broadcast though and that’s because of Vin’s unique, anecdotal style. You never know what you might learn when watching a Dodgers game and Scully is the perfect teacher – always interesting and informative.